Home » 2018EmmyAwards » 123 Reg Review: How Does This Huge UK Brand Stack Up? 123 Reg Review: How Does This Huge UK Brand Stack Up? WHAT DO YOU GET FROM 123 REG? 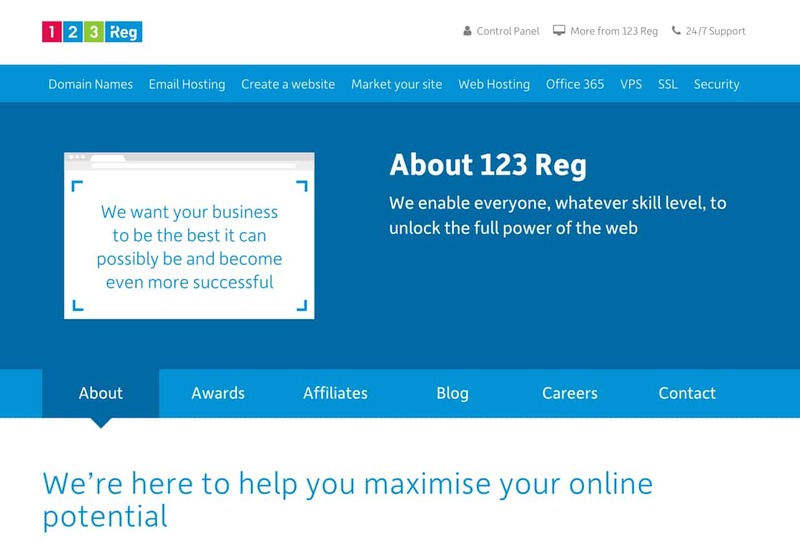 On the surface, 123 Reg is a shared hosting company. You can pay a small monthly fee to share a server with lots of other companies, and the performance is still solid. However, quite a few other services and tools are offered. These include tools related to security, backups, web design, and more. 123 Reg is an award-winning hosting company known for its low prices. 123 Reg offers a variety of web hosting plans from which you can choose. With 123 Reg’s entry-level hosting option, you can choose from four different plans. The plans vary in the number of domain names included, websites supported, and disk space and database allocation. If you would like a WordPress-friendly option, all but the most basic plan would fit your needs. 123 Reg only bundles SSL certificates with the two top-level plans, but fortunately, all plans come with unlimited bandwidth. At this level, there are three different plans from which you can choose. You can think of these plans as managed VPS hosting (or even cloud hosting) options. 123 Reg is responsible for most, if not all, of the work required to manage or maintain the server, but you do get access to a control panel to handle tasks related to your hosting and website. The downside to this setup is less control over your server; the upside is that you have to do less when it comes to server administration. Premium hosting plans come with a 99.99% uptime guarantee. 123 Reg offers hosting plans catering to users of the WordPress, Joomla, and Magento content management systems (CMS). While the number of plans you can choose are limited (two), what you do get is an easy-to-use environment that has been preconfigured to support your CMS. All plans come with a free domain and email services, backup and restoration services, one-click setup, unmetered bandwidth, and site migration assistance. 123 Reg also sells Virtual Private Servers as an alternative to shared hosting. A VPS is a more advanced version of shared hosting, where you still share a server with multiple companies, but the number of websites on the server is usually limited to a smaller batch. Furthermore, you gain access to tools and more advanced control panel modules, similar to what you would get with a dedicated server. 123 Reg doesn’t offer any dedicated servers, so a VPS is the most advanced you can get here. Basically, the VPS is a little more expensive than shared hosting, while remaining much cheaper than a private server. 123 Reg offers shared hosting plans that are packed with solid features, yet the company still keeps prices low across the board. Shared hosting is almost always pretty cheap on a month-to-month basis, but 123 Reg seems to be an industry leader in keeping costs low. Not only that, but the bandwidth is unlimited for all shared hosting plans, and you get a free UK domain name to go along with your plan. Some higher-tier plans even provide multiple domain names. Both simple and advanced website stats. As you can see, each of the shared hosting plans includes several additional features that often aren’t offered by competing hosting companies. Now let’s say you’d like to select one of these shared hosting plans and checkout. Are you going to have to pay a monthly fee or is it all upfront? As with many hosting providers, the pricing is quoted as monthly on the website, but you eventually have to pay for a full year upfront. This is one of the downsides of 123 Reg, since it’s nice to be able to choose maybe a six-month plan. Or maybe you’d like to save a little money and lock down three years of hosting. That doesn’t seem to be possible when going through 123 Reg. As you move through the checkout process and decide on your hosting plan, you can expect to see a few upsells that you can either skip or pay for. VAT is billed separately. Domain privacy: when publishing a website and buying hosting you have to give your personal information. This information is attached to your website for anyone to look up. Ideally, this would only be useful for people maybe trying to buy your site or contact you for business. However, it often results in spam. If you pay for domain privacy, your info is protected. 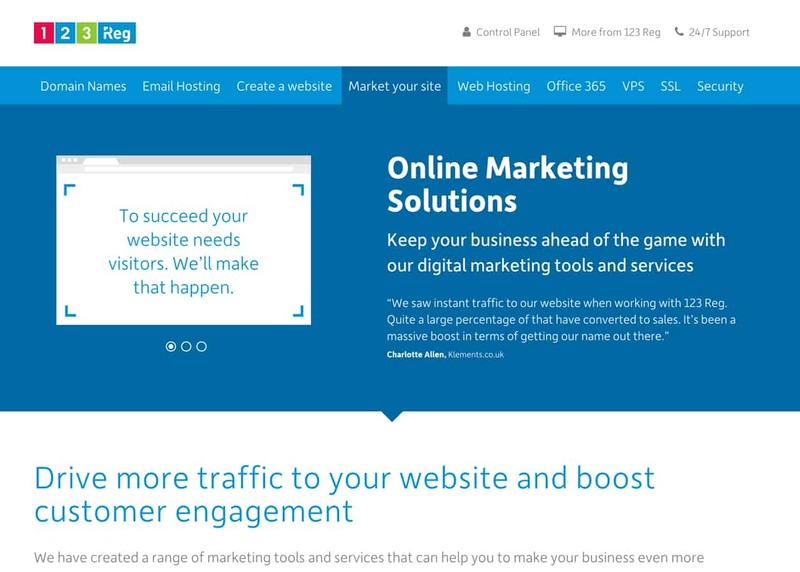 Website Builder: you get this with 123 Reg’s hosting plans, but some people might want to take advantage of the website builder as a standalone service. If you decide not to go with a hosting plan, 123 Reg still sells things like the website builder, domain names, and email hosting. Depending on the domain name you select, you could end up spending very little each year. However, pricing can go up to significantly if you choose one that’s already owned.